The Oversized Belt: Would You Wear It? Because we have a 24/7 watch on street style, any time a new trend emerges, we feel the need to share, which leads us to the topic of today’s slideshow: oversized belts. As of late, we’ve noticed some serious fashion insiders sporting larger than life belts, and think you should take note as this was a major trend on the F/W 14 runways. Scroll down to see how ladies like Giovanna Battaglia and Caroline Issa stylishly incorporate this bold accessory into their outfits, and if you’re up for the fashion challenge, shop the look! Tip: Try an oversized belt in the same colour as your dress for a monochrome ensemble that’s delightfully nuanced. Tip: Accent your favourite LBD with a large buckle. 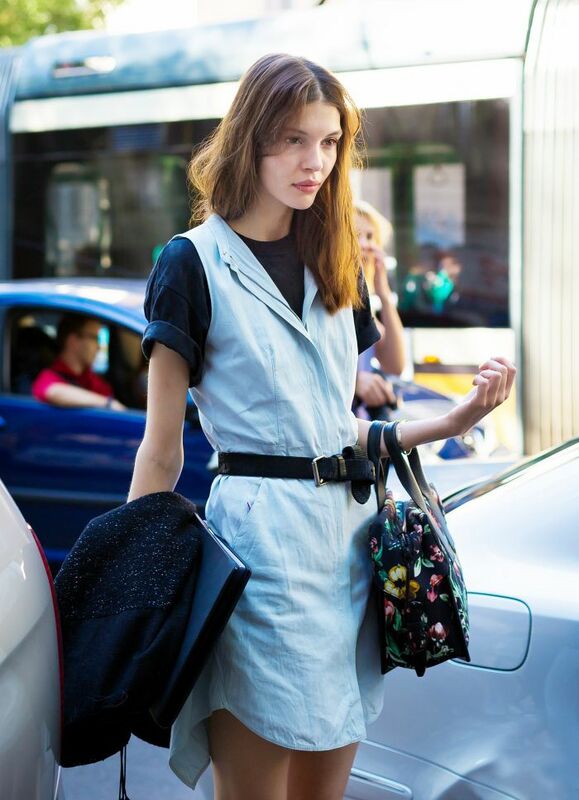 Tip: Style a big belt over a laidback piece, like a shirtdress. Tip: Wear a belt with multiple grommets for a statement-making look. Tip: Sport a corset-style belt around a silky button-down shirt. Tip: Pair an oversized belt with a sleeveless button-down shirt and a midi skirt. ?Keep scrolling to shop oversized belts! ?The beadwork on this belt is impeccable. ?This laser-cut belt may come with a hefty price tag, but a girl can dream. ?Because everyone needs a gingham-print belt to wear in the summer. ?This would look intriguing around an off-the-shoulder dress. We're in love with the oversized buckle on this classic style. Can you say: party belt? Style this metallic belt over a white shirt dress for a dynamic ensemble. ?What do YOU think about the big belt trend? Share in the comments below!